Mix everything together. Marinate overnight. Grill. The night before, the chicken goes into a bulgogi bath. Remember, it's the exact same marinade for chicken as it is for beef. 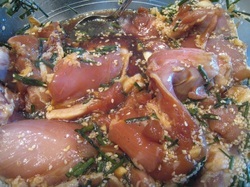 Making the marinade takes 10-15 minutes. Let it sit overnight. Best to do it the night before because inevitably, the morning is a mad blur and you may end up getting to work smelling like shoyu and garlic in your first closed-door meeting. If you can't or don't feel like grilling, pour a bit of sauce with the chicken and cook over medium heat. Let the marinade reduce so the chicken gets a good glaze. Slice thinly. This should take about 10 minutes and can be done while the chicken cooks. Flour tortillas. Warmed in the oven at 150 degrees with slightly wet paper towels on them. Purple rice. Add a scant half a handful Korean black rice to 2 cups of brown rice and cook as normal. Black rice is sold at Korean grocery stores and costs about $4. Regular rice is fine too. Lettuce and cukes. Shredded. 5 minutes elapsed time. Korean bean sprouts. Bought, but this is definitely something I'll get from Mom's recipe box. Kim chee. Bought. Leave this to the professionals. Gochu-jang sesame mayo. 2 spoonfuls of mayo, a quarter spoonful of gochu-jang sauce, a drizzle (very little) of sesame oil. Mix well and adjust to your liking. Sesame oil has a very strong flavor so tread lightly with it. Spread mayo sauce on the center of the tortilla. Add rice, chicken and whatever sides you like. Eat and be happy that you enjoy this sitting at your dining table instead of having to track down a truck.